I do a lot of wood bonding and this a great product. I use it a lot for assembly work where traditional screws or rivets are not required. Thanks to the people at NHS for keeping this in stock for me. easy to find, easy to buy, fast shipping, amazing price whats not to like! Thank you NHS. 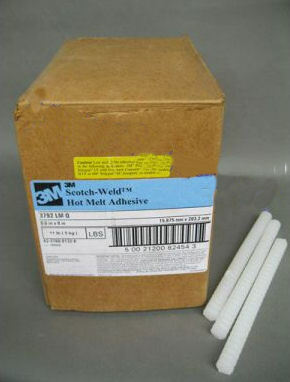 3M™ Scotch Weld Hot Melt Adhesive 3792 LM Q is a clear, general purpose low melt adhesive for product assembly. It is low melt, 100% solid, solvent-free thermoplastics resins that become fluid when heated with long bonding range adhesive. 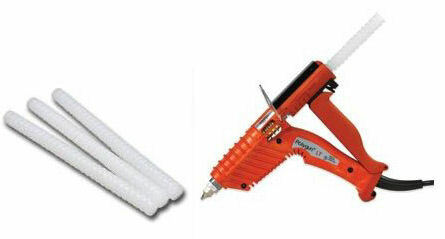 Bond heat sensitive substrates, styrene foam, wood, select plastics, corrugated, and lightweight materials. This general purpose plastics bonding low melt adhesive, 5/8" X 8"; must be dispensed with the Polygun TC w/Quadrack Converter. - Product Assembly, Assembling joining, attaching, securing, repairing, potting, panel bonding, wire tacking, bundling, sealing, encapsulating, rigidizing, foam bonding, gluing, packaging, adhering, and closing. Woodworking, furniture, automotive, transportation, aerospace, general industrial, upholstery, point of purchase display, sample boards, military, window, door, building, trophies, novelties, audio components, cabinets, construction, packaging, electronics, and product assembly. - Attach samples of wood flooring, laminates, foams, or fabric, or other materials and small products to display board.